Those that read my blog know that I traveled to Chicago for 10 days taking only a personal item. The trip was in the summer so packing was fairly easy. What about winter and all the extra clothing needed for warmth? Could I still travel using just a personal item? The answer is yes! I recently returned from a week long trip that involved mountain hiking, major storms, and time in the city. I dressed appropriately for all activities, even when I ran into unexpected challenges. I love autumn but rarely get to see it where I live. I decided to head up north to Seattle and Vancouver Island so I could sate my autumn longings. 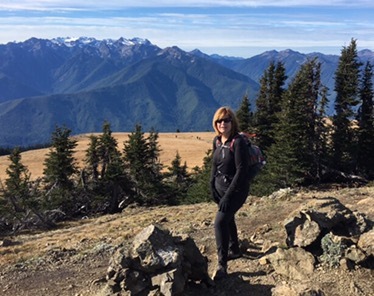 I also wanted to hike the Olympic Mountains in Olympic National Park. The Olympics are known for their rain. October weather could bring snow. This meant that I needed good protection from the elements. I also took part in a progressive dinner in Seattle, so I needed dress items. All of these activities created a packing challenge for travel with a personal item. In the end I was pleased with my choices. The actual trip presented several surprises that stressed my capsule wardrobe to the max. I once again used the Patagonia travel tote as my personal item. The main section of this pack is 16 liters. I relied heavily on technical clothing for my winter/outdoors activities. The pieces were light, low bulk, fast drying, and could function in both city and country. I also relied on silk long johns for warmth. These washed up quickly and easily and provided undetectable layers beneath my clothing. I layered my nano-puff jacket under my rain shell as needed. I also included my Montbell Versalite rain pants as a precaution for hiking in rainy weather. This provided protection for all winter temperatures. I started my wardrobe with my black technical pants. I added in a couple of 3/4 sleeve tee shirts and a light sweater for variety. I decided on jeans as my second pair of pants. Shoes were my greatest challenge. I changed my mind many times on which pairs I would wear. I finally decided on black ankle boots and my barefoot running shoes. The ankle boots have a soft rubber sole. They look great in the city and are comfortable for walking. My Merrell Pace running shoes are compact and very light (11.6 oz, 328 g). They have an excellent tread and a sticky sole, making them a good choice for light hiking. Here are that clothing items that I took, minus silk long underwear, socks, and undies. I wore the jeans, stripe top, ankle boots, and rain jacket on the plane. I decided to use a single large packing cube for this trip. It worked better than two smaller cubes. 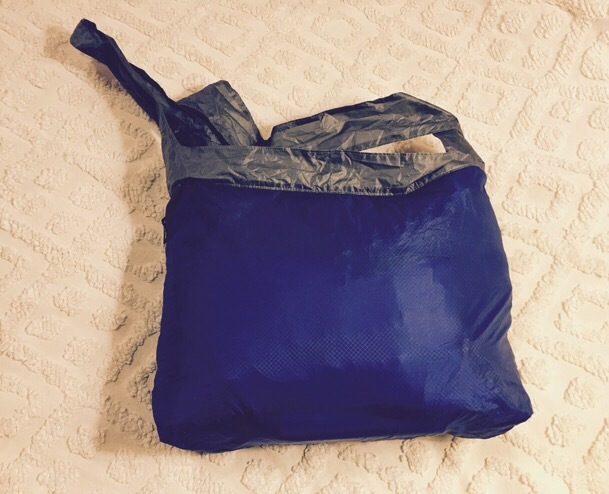 I bundle wrapped my clothing using my underwear as the “core” for the bundle. I then slid the entire bundle into an Eagle Creek Specter packing cube. I had very few wrinkles and these fell out when I hung up my clothes. The contents of my personal item. 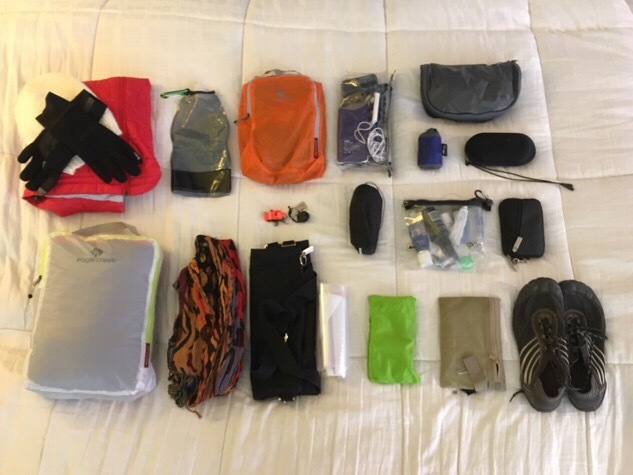 Top row, left to right: Nano-puff jacket with hat and gloves, water bottle, travel comfort kit, key chain with compass, whistle, bottle and can openers, electronics bag, rain pants, toiletry kit, ultra-sil sling bag, eyeglass holder with retainer, liquids bag, wallet. 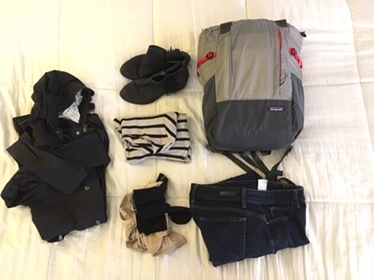 Bottom row, left to right: packing cube with clothes, wool scarf, Timbuck2 purse, plastic zip-lock bags, makeup bag, money belt with passport, Merrell pace shoes. 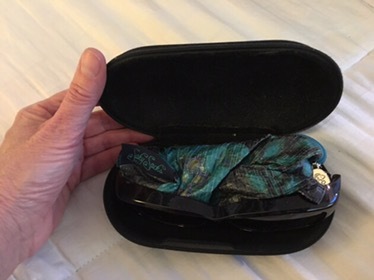 I packed my jewelry in the empty space behind my sun glasses. The packed tote plus the clothes I wore on the plane. My total pack weight came in at 6.5 kg. This excluded my wallet and phone, which were in the pockets of my rain coat. There was no weight limit from my air carrier but it was good to know that I could easily make a strict weight limit if needed. Under the seat again! There’s plenty of room even though I packed winter gear. The weather was beautiful and cool when I landed on Monday morning. I headed out to Snohomish Falls and immediately needed my rain coat! The mist from the waterfall soaked everything. Later that day I stopped by the Museum of Flight. It had warmed up and I was happy in my jeans and T-shirt. That evening I headed to Port Angeles to catch the Vancouver Island ferry. I slept in my silk long johns. 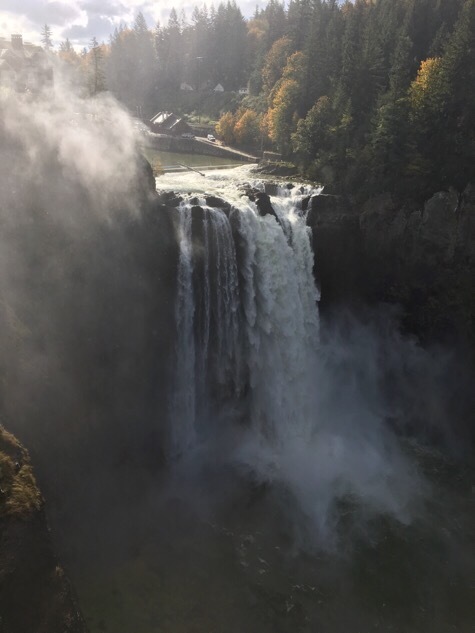 The falls are beautiful and misty! You’ll need a raincoat if you want to get closer. The next day was near freezing and I bundled up in both of my jackets for the ferry crossing. I left my tote back at the hotel and took my Timbuk2 purse as my day bag. The day warmed up and I stuffed my rain coat, hat, gloves, and scarf into my purse. I also opened up my jacket. The purse absorbed a pound of souvenir maple sugar candy on top of the clothing. I actually did a bit of sun bathing and whale watching on the ferry during the trip back to the states. 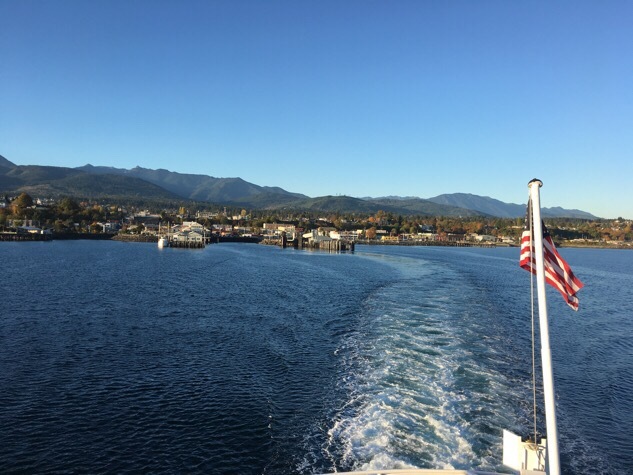 Leaving Port Angeles to Victoria BC via the ferry. The day started out near freezing but warmed up. 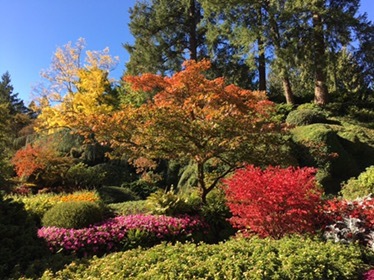 Any day is a good day at Butchart Gardens! They are beautiful almost any time of year. The day warmed up so I could wear my nano-puff jacket open. The nano-puff breathes so I didn’t overheat. Wednesday started out cold, with an incoming storm. It also turned into a day of surprises. Checking out the weather on the night before my hike. The day starts out freezing (26F, -3C) and gradually warms up. A storm is coming in from the Pacific Ocean in the afternoon. I planned on using my Patagonia tote as a day pack for hiking in the mountains. I dumped all my non-hiking gear into my spare Sea to Summit bag and threw it into the trunk of my rental car. 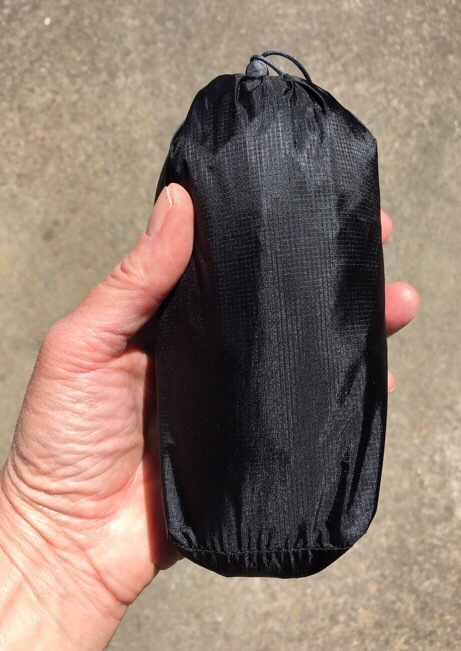 My packable Sea to Summit ultra-sil sling bag held all of my clothes when I used my Patagonia tote as a day pack. When morning came I checked out of my hotel and headed up the mountain to Hurricane Ridge. It was chilly starting out. I had all my outer gear on. All bundled up for freezing weather. It’s a beautiful, if chilly, morning. The hike to the top was all uphill so I quickly shed my protective gear. By the time I was at the top of Hurricane Ridge I was down to my base layer top and my black technical pants. I wore my silk long john top and bottom under the outer layers. I hiked in my Merrell Pace shoes. The Merrell Pace Glove barefoot runners have a sticky Vibram sole with an aggressive tread. 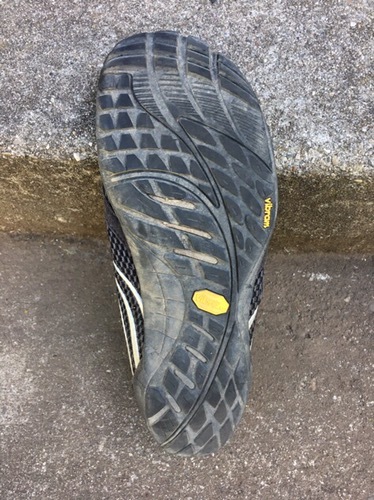 They are great for light day hiking if you have a foot that can handle barefoot running shoes. Standing near the top of Hurricane Ridge. It was windy at the top, so a little chilly. Note that I haven’t removed my gloves. My Patagonia pack has my food, water, puff jacket, rain jacket, rain pants, balaclava, hat, headlamp, whistle, compass, and smart phone. My hike headed into the drama zone on the way back down. One hiker, an 88 year old man, had collapsed on the trail. I administered aid. It became very clear that he would need an evacuation. It also became very apparent that I was the one person with the most wilderness first aid experience. This is why you prepare ahead of time! It took several hours to alert the park service, and a few more for the rescue team to show up. It took all the resources of the park plus the Port Angeles fire department to evacuate the patient. I was surprised at how few resources were available for rescue. 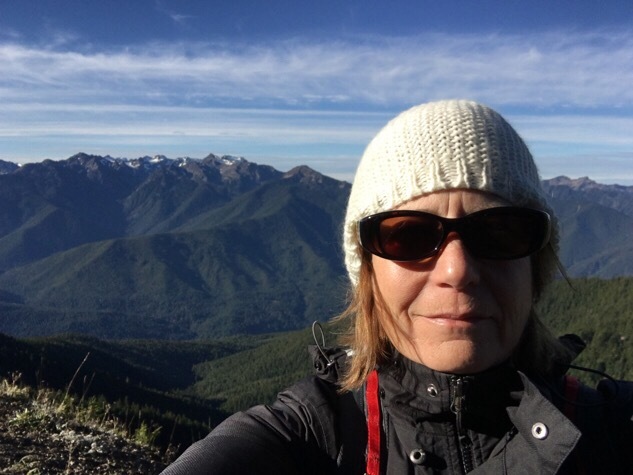 Olympic National Park isn’t Yosemite! In the end they took the patient down the mountain via ambulance. It took 4-1/2 hours to evacuate someone 1 mile (1.6 km) down the trail to the parking lot. From there it was another hour down the mountain to the hospital. 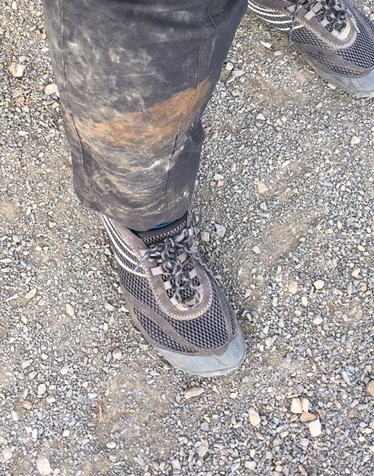 My pants became very dirty as a result of the rescue. Fortunately, they were Royal Robbins discovery pencil pants. I took them into the shower with me that night and they washed up easily. They dried in just a few hours. I spent the last couple of hours hiking out to Klahhane ridge. I decided to hike back when it started to rain. I was pretty tired from everything that went on. I also realized that I had forgotten to eat! I made the drive back to Seattle and dropped off the car before the worst of the rain started. I would use public transit from this point on. Storm coming in! 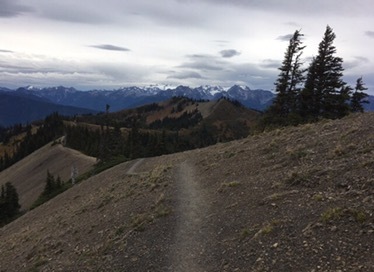 A view from the Klahhane Ridge trail. 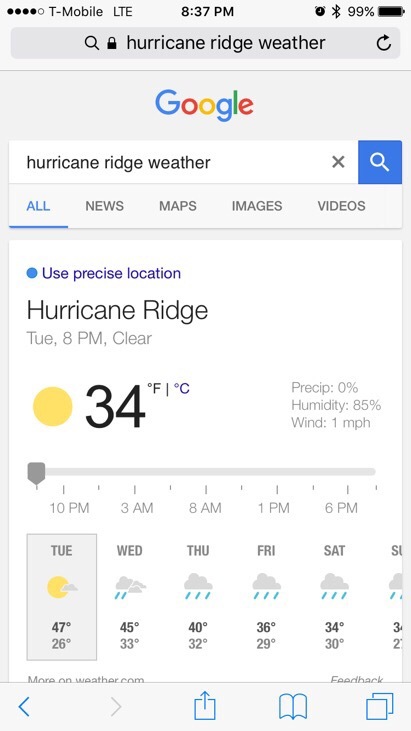 Weather alerts filled the next day. There were high wind warnings and flood warnings. The wind was pretty amazing. There were gusts up to 60 mph (96 kmph). I watched one tiny lady get picked up and slammed into a lamp pole. I was almost knocked over from the gusts. 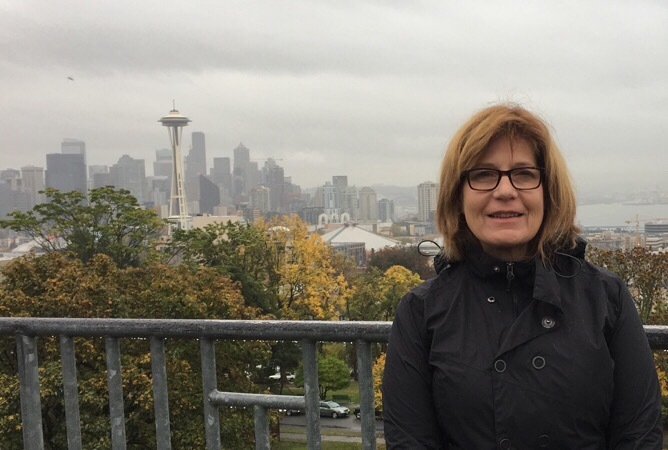 I had booked a tour of Seattle and I was going on it! I wore my nano-puff jacket under my raincoat. I also packed my rain pants in my purse. I wore my jeans and tee shirt as my clothing, with the Uniqulo airism tank top underneath. I spent the morning on the tour. After that I used public transit to go to various museums. It was a rainy soggy day. No, the weather isn’t stopping me! That’s why I brought a good waterproof jacket. The next day was windier than the previous one. Accidents and weather delayed most of the public transit. I decided it would be faster to walk to my destinations. I walked to the Museum of History and Industry for the morning. I signed up for a dressy progressive dinner in the afternoon. I wore my black technical pants with my grey mesh sweater. I added my Uniqlo airism tank underneath for warmth. I used my rain pants to stay dry. My rain pants were small enough to carry in my purse. They were available when I needed them. I swung by my hotel to pick up my luggage prior to dinner. I planned to go directly to the airport after dessert. My pack was so small that no one noticed that I had my luggage with me. Several of my dinner partners complained that they had spent the afternoon in their hotel rooms because of the weather. It made me sad because they had clearly brought the wrong clothing for their trip. While they were changing out of soggy clothing I was walking around enjoying Seattle! When I arrived at the airport my airline was asking people to check their carry on bags. They had oversold the flight and didn’t have enough room in the overhead bin. I had to tell them no to the bag check, because I didn’t have a carry on bag! I wasn’t a part of their problem, but I was definitely a part of their solution. I left the overhead bin clear. 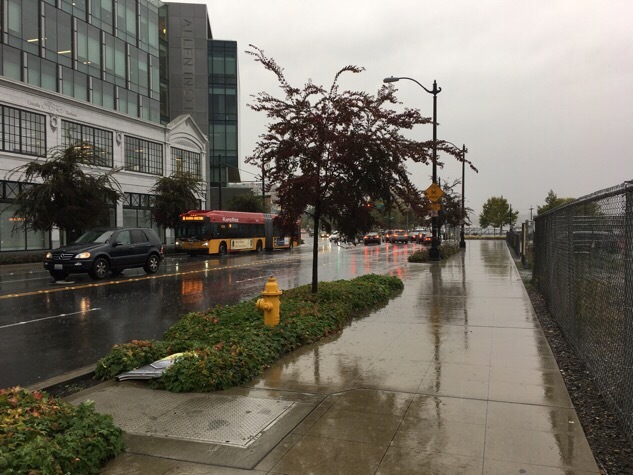 Soggy in Seattle. The public transit was running 15-30 minutes late so I decided to walk to my destinations. My rain pants kept me dry. In retrospect, I was thrilled with how everything worked out. I had all the clothing I needed, even for unexpected events. Near freezing rain is one of the biggest packing challenges and I was warm and dry the entire trip. I experienced warm days, cold wet nights, soggy storms and high winds. I had packed everything I needed. This trip would have been impossible without technical clothing. The black technical pants let me go from trail to dinner. The silk thermal underwear kept me warm. My base layer t-zip top provided coverage and warmth while hiking. The nano-puff jacket and high quality waterproof rain coat protected me from the elements. Stylish high performance clothing is worth the investment! My ultralight rain pants, while ugly, were available when I needed them. Most valuable item: My raincoat, followed by my nano-puff jacket. Things I didn’t use: My silk balaclava and my red drop earrings. That’s it! What I slept in: My silk long johns. I added my black waterfall cardigan when I was reading in bed. I used my raincoat as a “bathrobe” when I used the toilet down the hall. What I wish I had packed: My leggings. The heat went out in my hotel room one night and the extra leggings would have been nice. I could have put my jeans on if I wasn’t too lazy to get out of bed. What about dressing up? I could have added some black tights and a black pencil skirt for more formal occasions. There was extra room in my packing cube. There was also room for a light “grand foulard” scarf. What if this were a trip in deep winter? I would have changed out my shoes. I would have worn waterproof knee high dress snow boots and packed ballet flats with a slight heel. I also would have added an extra pair of outer gloves or mittens. I might have added an extra Airism shirt. What if this were a multi-week trip? I would have added one extra top in addition to my tights, skirt, and scarf. I might have switched out my jeans for another pair of technical pants. Grey pants would fit in nicely. The extra weight would probably put me past the 7 kg mark. I probably would stuff my pockets with electronics. Then again, the airline might not weigh a personal item. Want to take this wardrobe on a multi-week trip? Swap out jeans for grey travel pants. Add in one extra top, a skirt, tights, and a “grand foulard” scarf. So there you have it. A working minimalist wardrobe that fits in a personal item. Yes, you can do it even in the winter! Your tips always amaze me. I always work at traveling only with my carry on and a personal bag, but am not always happy with my wardrobe choices. It’s a work in progress! Last week we were visiting Montreal with friends for four days. We expected rain one day, so that was a museum visit morning. 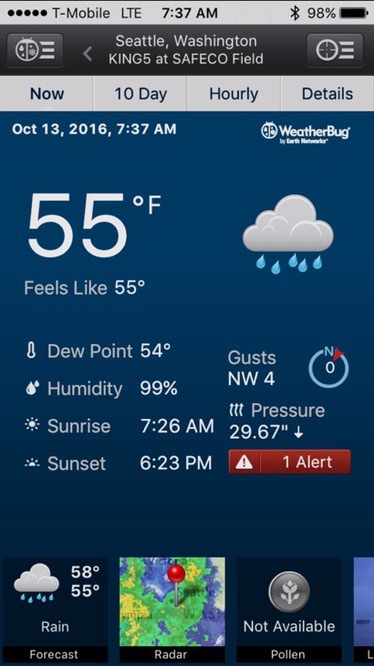 I had my LLBean black Gortex rain jacket, so my upper was dry and mostly warm (could have put another layer underneath). But my black cotton denim pants were soaked. Fortunately, I had a pair of dry grey NorthFace convertible performance pants In a ZipLoc in the bottom of the day pack. Wet black pants off and in the ZipLoc and dry pants on. So I enjoyed the rest of my day and the black pants dried overnight fortunately. But going forward, I should probably invest in some rain pants and silk long underwear for fall and spring trips. We prefer shoulder season travel because we experienced first hand the crowds in Paris in August, even though we had been warned. Rain pants help if you’ll be outside. My Montbell pants are smaller than a cup of coffee. I highly recommend them for travel. Likewise for silk long underwear. You can buy tops that have scoop necks and 3/4 sleeves so you’ll never see them under your clothes. There are also some very nice travel pants out there that look the same as regular pants. These are not baggy, ugly jungle pants. They come in boot cut, straight leg, and skinny cut. Look at Royal Robbins, Ministry, Eddie Bauer. All dry quickly when wet. I love shoulder season travel. No crowds! Waterproof shoes, a puff jacket and a pair of base layers turn your regular clothes into cold weather wear. Bravo! Great job figuring it all out and I like the travel commentary illustrating how it all worked out. Brilliant job! I’m planning for a 5 week study trip to Japan in Jan-Feb. Being from Australia I’ve never experienced a serious winter, so your tips are absolute gold. Thank you! There are a couple of ways to keep warm. The first is to wear thermal protection under your clothes (long johns). The second is to wear thermal protection over your clothes (sweaters, jackets, scarves). When it is really cold we do both. I wear silk under my street clothes when I’m just walking around. The filament and light weight silks are undetectable under street clothes. For heavy duty activities I transition to merino/synthetic. If I were you I’d pick up a couple of cute merino wool cardigans before I left for Japan. Australia has great access to merino! You may also want a merino T-zip top and merino leggings/tights for active winter sports. Also bring 2-3 patterned scarves in your capsule wardrobe palette. The scarves don’t have to be too heavy – they just need to seal the air gaps near your neck. Some scarves show different colors/patterns when folded differently. These will give you the most style options. A good outer coat and waterproof shells (coat & pants) will finish it. I would also recommend wool gloves and a second waterproof outer shell for deep cold. Consider shell gloves that have the electronic touch tip finger for phones. Then you don’t have to remove your gloves to use your phone. Fingers (and toes) don’t have a great blood flow so get cold easily. That means good wool socks too. Oh, and cover your head with a good hat to keep warm. Your body will protect your head at the expense of the other body parts. So if you are cold then add a hat. Do what you must to prevent getting wet. Once you are wet you get cold easily. That’s why layers are so great. You start stripping them before you start sweating. You put them back on when you stop your activity and are standing around. One other point about living in a warm weather area. Forget about finding any good stuff in a store! The stores have no idea what to order. You’ll need to either get your stuff over the internet or buy it in the cold weather destination. If you are anything other than Asian you may want to look at the internet. The sizing is usually significantly smaller for Asians than for other races (except for the North Island of Japan). You may have a hard time finding clothing in Japan, or be forced into paying more for it. Here is a size guide. Thanks so much for taking the time to respond. I’ve been reading your blog for a while, and have taken on a lot of your advice. In particular I hunted out a cute and properly-waterproofed light raincoat. Fortunately I live in the far south of Australia where things are colder, and I found out about this trip before the stores switched over to their spring stock, so I’ve been able to make some purchases in store at sale prices. Merino will certainly feature prominently in my wardrobe, and I’ve ordered some silk thermals. Fabulous post, pictures and list. You are an inspiration and I really like the detail. I live in the PNW – it is beautiful but a rain strategy is a must. This post was very helpful. I’ve done winter travel with a carry on but never with only a personal item. I like the idea of letting the silk thermals double as pjs. It’s a process getting down to that level. 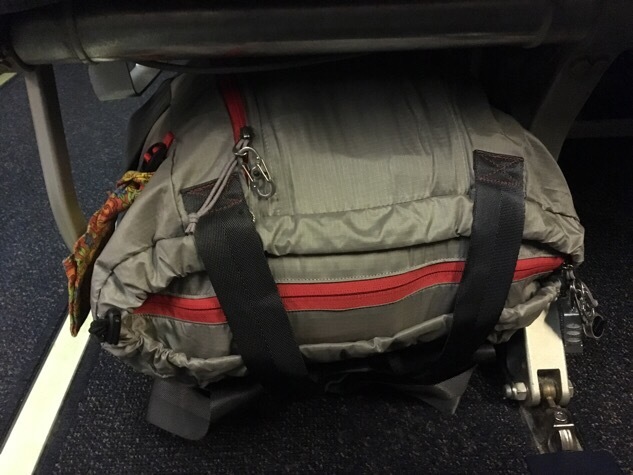 I enjoyed your posts and video on the Tom Bihn Synapse 19. It looks like you can do personal item travel too! First, hats off to you for assisting in the rescue. A example of humanity at its finest. Second, thank you for your terrific blog. I’ve used many of your tips and they have transformed my travel experiences. Thanks! I’ve been lazy in posting this year. I have a few articles in the queue. Some will help people take it to the next level, I hope. Great advice. Packing and traveling in the winter is completely different. I travel everywhere with just one small backpack and I never miss what I don’t pack. I usually travel to warm areas though. Thank you for the great tips! We’re taking a 7 day cruise to Alaska, leaving from Seattle next month (May). We’ll be in Seattle for only 1 additional day, so our trip is for a total of 8 days. Do you think it’s possible to go on this trip with only a personal bag? I think it’s definitely possible, especially if the cruise is a casual one. Are you taking hiking shoes? Definitely wear those on the plane. How are your laundry facilities on the boat? That will determine how easy it will be to pack less. Are you bringing binocular and camera equipment? If so you may be happier with a regular size carry on.